The 7 Elements of Courage. Bravery, Energy, Honesty, Industry, Enthusiasm, Persistence, and Fear - all of these powerful characteristics are part of Courage. The IAmElemental Courage Core Power 6 1/2-Inch Action Figure represents the 7 Elements of Courage. 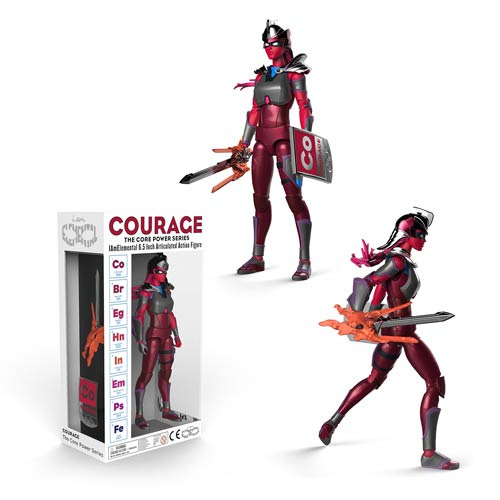 The Courage Core Power figure stands approximately 6 1/2-inches tall and has over 30 points of articulation. Figure includes removable helmet, chest armor, flaming Energy Sword, and Courage Shield. Ages 4 and up.